The Live Archive season features screenings to examine historical relationships between film and performative actions, with a live film performance commissioned by Vivid Projects and presented as part of Flatpack Film Festival’s Optical Sound strand. Wall Support | George Saxon | 1977 | Twin screen video – looped projection. “I looked keenly around – sound-proofed walls, dollies, machinery, lighting equipment; the paraphernalia of film. Every part in the scheme reinforced the other parts. Every part conspired to keep secret its true nature – referring not to itself but to another – all parts in the machinery serving the whole – the whole serving the film. Continuous take. The body functions as a machine against the wall. Both image and sound appear out of sync throughout the intense repetition of action – the mechanical performance of the body on film are hyphenated by periodic lapses as the body tires in submission”. GS. Anna Thew, 1990, Fallacies of Heroism & War. 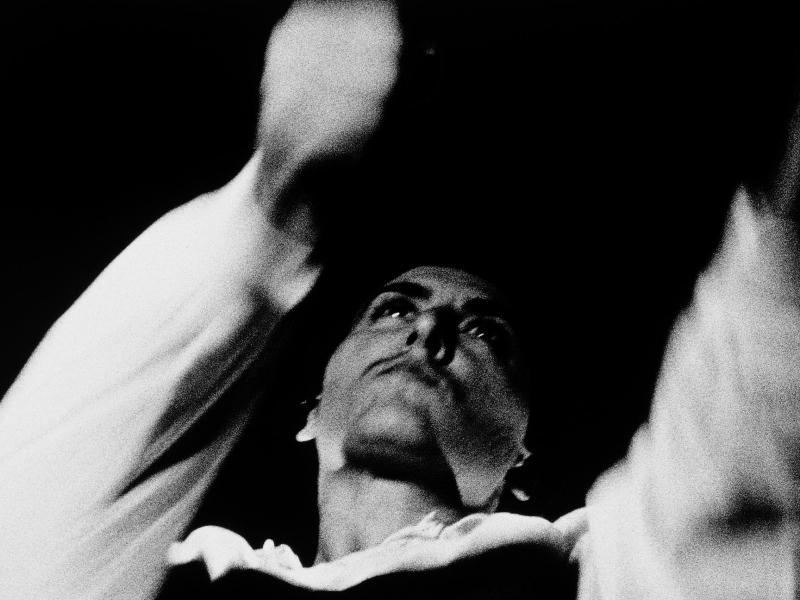 Visit our video library and choose from a selection of works documenting post ’68 performance and live art practice. Live 16mm performance during which performers and audience are immersed in an artillery battery of light and sound. Approximate running time 60 minutes. Content may be subject to change. Ritual In Transfigured Time silently follows Rita Christiani’s perspective as she enters an apartment to find Maya Deren immersed in the ritual of unwinding wool from a loom. The notion of external invading the internal is enhanced by a strange wind that surrounds and entrances her as she becomes transported. The looming ritual is linked with the ritual of the social greeting, and continuity is established by an emphasis on gesture and/or dance throughout. Falling Under is a collaborative dance piece between Baldwin and choreographer Suzanne Watson. Using the music of John Surman, the piece is a lyrical improvisation by four dancers perfectly translated into video by a poetic use of super 8 and natural lighting. Located in darkness, a place of no boundaries, Delilah is a ‘meditation on violence’, love and survival. Gendered gestures of empowerment, fight and flight are sharply framed in chiaroscuro light. Three women stage a percussive exchange, moving through tension and release, power and abandon. ‘The outside is within us. You moved like a warrior but I could not hold you.’ – T.S. This film programme was originally conceived as one of four programmes for Film and the Other Arts: Intermediality, Medium Specificity, Creativity, an interdisciplinary research network funded by the AHRC (2015-2017). Curated by Tanya Syed and Kim Knowles with thanks to LUX Distribution.